"Getting kids to cry isn't the nicest thing to do." The words are Jill Greenberg's. In 2006 we were treated to what passes for a controversy in contemporary photography. 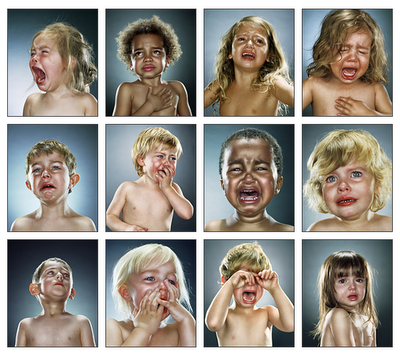 Greenberg, a commercial studio portraitist from Beverly Hills—she had previously gotten attention from the art world for a series of beautiful studio portraits of monkeys and apes (right)—made a small series of pictures of young children crying. (A small exhibition catalog was published called End Times.) A blogger named Thomas Hawk (a pseudonym—his real name has been "outed," though I don't see any reason to repeat it here, since bloggers have a right to present themselves as they wish to be presented) wrote an inflammatory protest about the pictures, making charges of child abuse, among other things, and the argument has simmered incessantly from the blogosphere to the New York Times Magazine, including criticisms ranging all the way to death threats against Greenberg (that's a bit much) to outraged defenses of her by the owner of her gallery and her husband, some of which were later withdrawn. American Photo: How did you come up with the idea for the project? Jill Greenberg: "I saw this little girl who'd come to a party with her mom, and she was beautiful, so I thought it might be interesting to photograph her. When they came to my studio, the mother brought along her toddler son, and I decided to shoot him too. We took off his shirt because it was dirty. He started crying on his own, and I shot that, and when I got the contact sheets back I thought, "This could go with a caption, 'Four More Years,'" like he was appalled at George Bush's reelection. The images have a real power—they immediately get under your skin. The emotion you see is just so compelling, yet they're beautiful at the same time. That was one of the things that interested me about the project—the strength and beauty of the images as images. I also thought they made a kind of political statement about the current state of anxiety a lot of people are in about the future of the country. Sometimes I just feel like crying about the way things are going." It's not for me to try to put in the last word on the controversy, and I wouldn't put a cap on it even if I could: reacting to photographs is the right of every viewer, and I would no more seek to suppress the outrage of those who feel outrage than I would seek to censor the pictures. It's been widely noted that Ms. Greenberg and Paul Kopeikin, of Kopeikin Gallery in Los Angeles, have benefitted from the publicity: the prints of the crying babies sell for thousands of dollars each, and, I'm told, sales have been brisk. Personally, I can think of two dozen things more obscene than a crying child that are photographed every day, and as a parent I'm not particularly upset about the idea of making a child cry, although I agree that it isn't the nicest thing to do. I probably wouldn't have had the heart for such a project myself. But one thing I will say is that photographers often show things that non-photographers would prefer not to look at, or at least would not choose to commemorate. It's always been thus, and it ever will be. What I think has been overlooked is that the pictures themselves are amazing, and not like anything you've ever seen before. Jill Greenberg has developed a style that is almost Koonsian* in its shiny, sculptural plasticity, perfect for the emotional remoteness of her postmodernistic gaze. It's perfected and distanced from perfection at the same time. The pictures themselves are beautiful and original, familiar and moving and yet still strange and new. They certainly encapsulate, just perfectly, an ambivalence between looking and not looking, between objective aesthetics and subjective empathy. Encouraging people to think, and encouraging immediate, visceral—and, moreover, personal—responses are a big part of what art's all about. For managing that (perhaps to a greater extent than she'd bargained for) while at the same time bringing new vitality to the modus of the classic, straightfoward head-and-shoulders studio portrait, Jill Greenberg is T.O.P. 's Photographer of the Year for 2006. * The reference, in case it's unfamiliar to you, is to the American artist Jeff Koons. UPDATE: As a corrective to some of the more hysterical comments I got about this post, I thought a little moral and emotional calibration might be appropriate. Mind you, in objecting to the polarizing tendencies of others, I hope I'm not polarizing myself here—there is an element that is distressing and, yes, even a little disturbing (in the sense of not-quite-right) in Greenberg's pictures. I can sympathize with people who are villifying and even demonizing Greenberg, to an extent. But what they're talking about are their own feelings, not anything objective about the children, or their parents, or the photographer. There is another issue no one has broached yet. To me, there is also something a little disturbing about people who reserve their strongest outrage and disapproval for relatively benign, palatable transgressions, while remaining silent about things people really ought to speak up about if they have the freedom to. I can't, and won't, paint any individual reading this with that brush; obviously, no one has expressed the entire range of their moral positions, nor do we need to in order to comment on one issue. But do you know what I mean? It's like people who express deep outrage about dead cat jokes and then keep silent about the millions of healthy cats that are euthanized every year. It's a form of moral displacement. There's something a little off about that, too. But back to the pictures—I'm getting pretty far afield. We've heard a lot about how Greenberg's political associations are just dumb (I agree) and that the End Times pictures are kitschy (they sort of are, but in a good way—anyway, you try it), but one thing no one has done yet is this: propose another set of pictures made during 2006 that is more memorable, or that has been as much a part of the visual zeitgeist of the times during the past year. That's a comment I'd like to read. Now this. People in authority making money on the distress of defenseless children. And it doesnt bother you. In some part of Africa, the biggest pimp is the familly; parents, brothers, cousins selling teens into European brothels. In the US it's this. Making children cry so someone can make money off them. How sad. You can't always be the innocent bystander. At times, you need to stand up. To the contrary, it DOES bother me. How could it not bother anybody? you've never watched a TV add that shows some little kid crying? How do you think they do that? I assume a similar level of "outrage" is expressed each time one appears on the screen. Add in that crying and screaming is the natural state of affairs for a lot of small kids I know - it's not like you need to encourage them to do it. "In some part of Africa, the biggest pimp is the familly; parents, brothers, cousins selling teens into European brothels. In the US it's this. Making children cry so someone can make money off them. How sad." This isn't even in the same galaxy as "selling teens into prostitution." The parents took away a lollipop from the children and the photographs capture their reaction in the moment that followed. The photos are disturbing, as much good art is, but to suggest that these kids were affected in any way even five minutes after the shutter was tripped is ludicrous. How is this any different than all of the babies who have cried "on cue" in films? Did you think they were acting? The subjects weren't beaten or screamed at, they were denied a piece of candy for a moment and it just so happens that kids react pretty much the same way no matter the level of injustice. Remarkable, valuable, and even beautiful photographs have always been made of disturbing subject matter. Just look at James Nachtwey's work. I agree with Mike, it's actually a stupid idea that has resulted in some great pictures. Disturbing and worthwhile are not mutually exclusive.
" 'as a parent I'm not particularly upset that someone would make a child cry on purpose'...I was with you through the whole piece, Mike, but for [that] line"
Perhaps I should edit that. What I mean is that we need to keep our heads about us when calibrating for moral outrage. Little kids do cry all the time, and sometimes it's parents who make them cry, sometimes inadvertently and sometimes on purpose. Can any parent say they never made their child cry? Sometimes they cry for no reason at all and you can't comfort them no matter how hard you try. 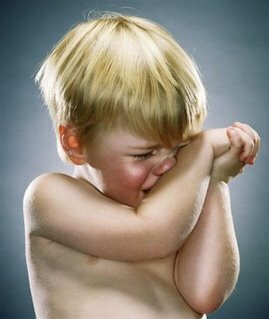 When my son was three, he would cry easily only if he were overtired or hungry--he wasn't much of a crier. But there were plenty of times when I'd put him in "time out" for very good reason and he would look very much like these children do, and I wouldn't go comfort him until his minutes were up. It didn't hurt him. Today he's a well-adjusted, calm, and poised soon-to-be 14-year-old. That's just childhood, I think. Of course the children in the pictures do distress us and tug at our heartstrings--just asm when I hear a baby crying somewhere, it evokes a strong urge in me to try to comfort it! But that's part of what the artist intended, part of how these pictures work. To me, these are academic pictures of children crying with the sentimentalism that defines kitsch. No, Mike this is simply kitch; the rest is "show biz" à l'americaine. Where has your inbuilt "kitsch-alert" system gone? There is something very disturbing about these photographs. It seems like the children are dead and frozen in wax. They are very cold and frightening. 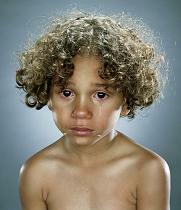 These are really not photos of crying children, but an artistic and/or political statement. "Encouraging people to think, and encouraging immediate, visceral—and, moreover, personal—responses are a big part of what art's all about." Yes. But these pictures go for that immediate, visceral response, and that's all they do. They are the hangover without the drinks the night before. Forgettable. Sure the lighting is interesting, in a plasticky, overly artificial way. But the pictures themselves are empty. They produce that reaction in us, and then we realize that the reaction was exactly what was expected from us. We are as manipulated as the little kids were. That, plus the non-sequitur of relating this to current politics (I'm on the left, but no thanks, I don't care for Jill Greenberg as an ally), plus the obvious purely commercial attitude of the photographer, plus the overreaction of Thomas Hawk (who seems too interested in self promotion for my taste) makes me think the the whole thing as a catfight between people whose egos are a couple of sizes too big. I agree with Mitch - regardless of how you feel about the subject matter I find the actual pictures to have an artistic quality about on par with that of bobblehead dolls. Both concept and execution strike me as being irretrievably shallow. What troubles me is that the children were crying for no important reason, and to try to make more out of than it is, is a lie. These pictures shouldn't be upsetting unless the viewer is using personal emotional baggage to give meaning that isn't there. This reminds me of manipulative pop songs that use phony emotional content to elicit a response from the listener. 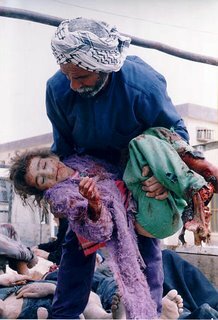 I think the debate about making children cry for a photograph is interesting because if the subjects had been animals instead of children, there would have been no debate. If animals had been deliberately put in some kind of distress for the purposes of a photo, I'm sure some group like PETA would have been doing more than just threatening legal action. Therein lies the real social commentary here, I believe. Hopefully she had the good sense not to include such comments in the presentation of these photos. Yeah, I could cry over Bush, too, but those kids where crying because someone took their lollipop. The meaning of a photograph is very dependent on the context provided by the photographer. My family recently learned that a photo of a recently departed family member is to be included in a book by a famous fine-art photographer. Introduction by a Booker Prize winner. Exhibition at the Whitney Museum in NYC. Big stuff. However, the photo is presented in a context which in this case is a big whopping lie. How are we served by lies? I think photographers have a responsibility to tell the truth about their photos. If Greenberg was simply saying how she felt, no problem. But if there was any political statement connected with the presentation of these photos, that would be ridiculous. Great pictures. I must say I'm amazed at the distorted levels of sensibility some people has. Are any of those people pro choice (just to add some crazy perspective)? I think there is worse stuff on tv every second. We could even say these children are learning a trick of the trade. They will probably see their pictures later and understand the whole idea. Man, this culture seems a little schizophrenic from time to time. Thanks for bringing attention to this photo series. I hadn't seen it before. It's brilliant. It seems to me these are pictures that will ultimately become a bunch of "who cares" images of the future. IMHO, most of what I've read or seen about them is over-reaction. They are not nearly as horrific to me as some would suggest, nor are they nearly as good as some would suggest. Either way, my prediction is that the intensity of reaction will diminish over time and that ultimately they will become boring and go away on their own. 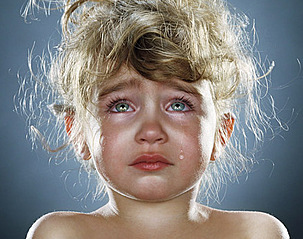 I think the photographs magnify the impact of the children crying, making the images upsetting to look at. 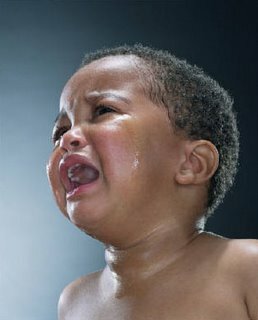 Kids at that age cry like that many times a day. They often morph from tears to joy in seconds. It's not upsetting to see kids crying in real life in a store, playground or in your house (unless they have really been hurt). It's just that the way the artist has frozen and magnified the moment that evokes the response. I'm, sure the subjects were sucking a lollipop and smiling within minutes of the shoot. Child abuse? I don't think so... not even close. I wonder how many of the people who are actually so upset about Jill's images are actually parents. I have 3 kids and they cry and yes, sometimes I snap a picture of it---not to exploit, but to capture a moment, an emotion. Their tears are real and seconds after the shutter is released, they are met with a giant, comforting hug and kiss from me. They then feel better, and later, when viewing the photos, they often laugh over the little thing they were so upset about in the first place. Mike, the images you posted in your update literally made my stomach turn. As you pointed out, THESE are the images that should bring outrage--and not for the photographs themselves, but for the events that led to situations. Instead of worrying so much about some Beverly Hills rich kids who get anything and everything they could possible ask for, let us direct our outrage and concern to the millions of kids who are starving, neglected, abused and exploited around the world. And I applaud the photographers who have the guts to photograph these poor souls (with a HUGE exception to the pornographers, obviously). I certainly wouldn't have the stomach for it. Wow, talk about REopening a can of worms! First off, I love pigs, and I love pork- I am a full fledged hypocrite like most (all) humans, 'nuff said. I agree with you wholeheartedly about what really constitutes child abuse throughout this pathetic world of ours. That said, her child portraits have more in allegiance with the crying, B&W, baby product shots of the 50's than any lame "political statement." And trying to get one of her critics in trouble with his boss (if that, in fact, is true) shatters any notion of her alleged progressive politics. 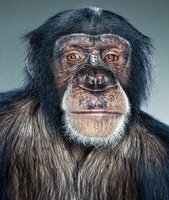 I do like these portraits, they're great visual eye candy, pun (not) intended- even if they don't have the depth of her previous monkey portraits. They probably are the most controversial images of the year- although any of the ones you posted in response SHOULD be. Exactly. I think it's interesting how much "documentary" photography is like this. Photographers select images to convey particular emotional impressions, which may or may not accurately characterize the situations they are photographing. It's as though they were painting. I don't think it's a big deal in the case of Jill Greenberg, since everyone understands that the photographer was (mildly) manipulating her subjects to create an emotional effect. And there are many documentary projects where the photographer has an axe to grind but is open about what he is doing, which I think is fine. But I think it's a frequent source of corruption in journalism. If you posted a similar staged photo (i.e., of an apparently enraged demonstrator throwing a rock) in a photo discussion forum, some of the forum members might call them "powerful," because they confuse the impact of such images on their own emotions with the events underlying the images. (Another commenter here made a similar point.) It's as though some viewers confuse theater with the real thing. Sometimes the theater distills reality into clear principles, and thereby conveys real and important lessons, but sometimes it is used to manipulate and deceive. (Again, I don't think Greenberg is a problem, because everyone knows what she was doing.) But because of the great emotional power of images, we should be vigilant about such attempts to manipulate in what is ostensibly documentary photography. What people need more than anything is 1: More perspective on life. And 2: in general to chill. Hysteria has always done a lot more harm than whatever people were hysterical about in the first place. Also I agree, disturbing pictures, but beautiful. Anyway Mike, a good pick! Interesting pictures with a very unique and coherent style. Good choice, if only because she's managed to shock even photographers in this day and age … while not actually doing anything shocking. 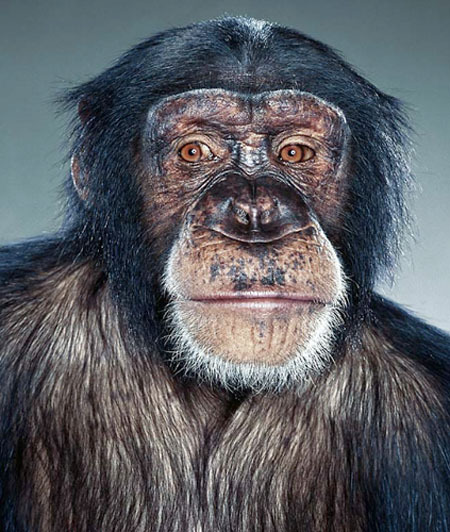 Personally, I think her photos of Stephen Colbert for Wired are much better. I think the ensuing debate is better than the pictures ... but if the pictures themselves can inspire such debate, maybe that's their true measure as art. "...but one thing no one has done yet is this: propose another set of pictures made during 2006 that is more memorable, or that has been as much a part of the visual zeitgeist of the times during the past year. That's a comment I'd like to read." It's a terrible thought, Mike, but you might be right: 2006 was not a banner year for photography. What happened that allowed her work to float to the top? I can't name any set of photographs taken in 2006. I like photography more than I like photographers. I am not about to use the strong language that has been bounced about on this topic but... I am not all that impressed by oversaturated images of children crying, especially in the "horror film" lighting. You have made your opinion on this choice abundantly clear, and it is your blog. As a parent I do find it somewhat disturbing, we can justify this by comparing it with the true atrocities that take place in the world, but... does the child understand that? 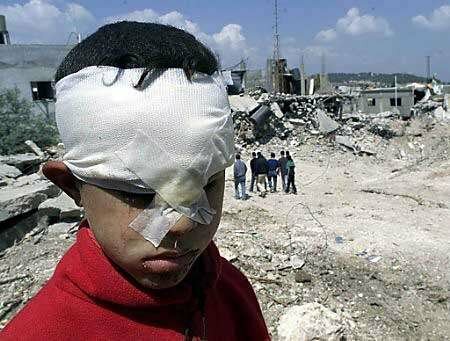 Does the fact that the child has no physical, nor long term psychological, damage mean that it is acceptable? Is it not a form of exploitation if we take advantage of young children in the name of art? Does it have to be a major traumatic experience for it to be wrong? I have no problem with the artist, nor do I see this as a terrible thing but there is a difference between accepting it as art and lauding it as the best art. This is just my opinion, I reserve the right to be wrong. "I like photography more than I like photographers." Can I put little paper booties on my cat (using rubber bands) for my own enjoyment? If so, how long can I leave them on?